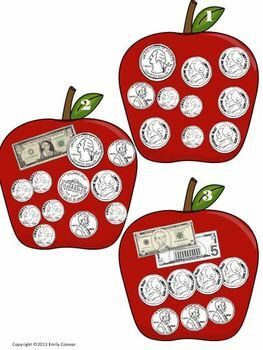 The first objective of Money Tree is to show many representations for a value of coins and dollars. 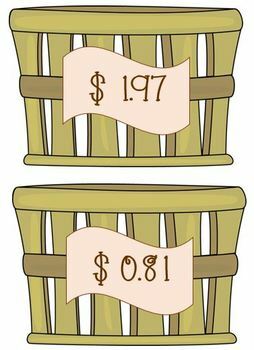 Money Tree is able to do this by having the student match three apples to a basket with a price amount. Money Tree has ten baskets and thirty apples. The answer sheet is provided. 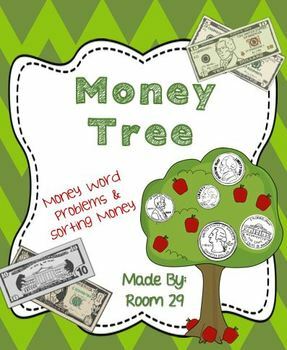 The second objective of Money Tree is for students to be able to add and subtract values of money in two and three step word problems. 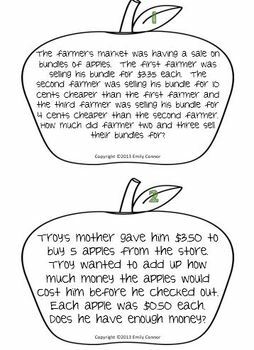 Money Tree word problems are very difficult, but are essential the student know and be able to work out. The Money Tree word problems can be used as task cards, small guided groups, or for students to work out together in pairs. The answer sheet and recording sheet is provided. • Look for the red star near the top of any page within my store and click it to become a follower. Voila! You will now receive customized email updates about this store. • Steps to Problem Solving Posters. • Math Task Card Bundle. • Number Sense Task Cards. • Addition and Subtraction Task Cards. Copyright © 2013 Room 29 (Emily Connor). All rights are reserved by the author. This product is to be used by the purchaser only and cannot be copied for more than one teacher, classroom, department, school, or school system. This product may not be distributed or displayed digitally for public view. Failure to comply is a copyright infringement and a violation of the Digital Millennium Copyright Act (DMCA).